HomeTest Update: Flint River water 19X more corrosive than Detroit water for Lead Solder; Now What? We are now three weeks into our laboratory experiment w.r.t. testing the relative corrosivity of Flint River water versus Detroit water. As the test continues, it becomes a more accurate measure of the relative corrosivity of the two waters. We previously noted, that it would be expected that Flint River water would be much more corrosive than Detroit water, due to its higher chloride content. Test 3 was conducted, to see if adding orthophosphate to Flint River water would stop lead corrosion. About 50% of water companies in the U.S. add orthophosphate to their water to control lead corrosion, but it is not currently added to Flint River water. From the data shown above in Figure 1, it is clear that Detroit water is much less corrosive to lead solder than the Flint River water. 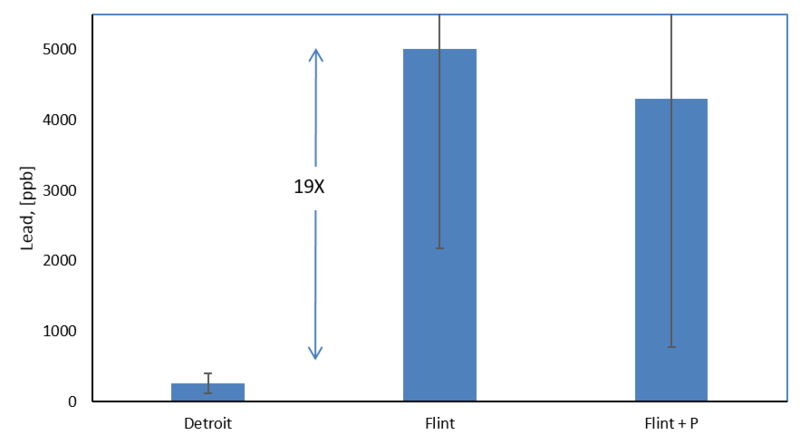 On average, Detroit water is 19 times (or 19X) less corrosive than the Flint River water currently in use. That is, the current Flint River water leaches 19X more lead to the water than Detroit water. This explains why the lead in Flint’s water in our survey, is so high, even when it was low before when Detroit water was being used. We can actually still see the high lead in the Flint River water test by eye (i.e. as white particles suspended in the water). Lead levels in our test with Flint River water, were slightly above hazardous waste levels (5000 ppb), which is still lower than the worst levels of lead we detected in the home of Flint resident Lee-Anne Walters. Orthophosphate still does not seem to help stop lead leaching in Flint River water, which is also consistent with expectations based on experiments in high chloride water. There is a slight improvement, but even with phosphate, Flint River water has 16 times more lead compared to the same condition using Detroit water. We will continue to run these tests, but at present it does not seem like orthophosphate will provide a quick answer to the very high lead levels in Flint water. Conclusion: On a scientific basis, Flint River water leaches more lead from plumbing than does Detroit water as predicted before. This is creating a public health threat in some Flint homes that have lead pipe or lead solder. Unfortunately, adding orthophosphate corrosion inhibitor to the Flint River water, does not solve the lead problem. Step 1: Issue Scientifically Sound Advice. Likewise, during our sampling events in Flint homes, we are finding very high lead in other homes with modern lead free plumbing, which again points to city owned lead pipes and corrosive water as the problem. On the basis of these facts, we consider MDEQ’s position to be both unscientific and irresponsible, and we stand by our recommendations to Flint consumers, that they immediately reduce their exposure to high lead in Flint’s water by implementing protective measures when using tap water for drinking or cooking. Step 2. Implement Corrosion Control. Switch back to the non-corrosive Detroit water. It is our opinion, based on years of experience, that Flint’s lead levels would drop markedly in about one month. Add orthophosphate to Flint River water. As indicated in this work, orthophosphate will not reduce lead leaching from all lead plumbing sources. On the basis of our extensive experience, we would only expect modest improvements to water lead levels if orthophosphate was added. Wait for KWA pipeline. If orthophosphate was added to water from the KWA pipeline, it would be about the same corrosivity as Detroit water (Option A). In that case, Flint residents will have to live with the very high lead in their water, until at least one month after the pipeline is connected. Politicians and residents will ultimately have to look at which of the above options is best for Flint, after weighing feasibility and costs.